It’s Monday, and today’s Slay The Books Look Back to School Fashion 2017 Look 3 is all about that nerd life. As I talked about in Look 2 of slay the books (band geek), using archetypes, or stereotypes, as a basis for categorizing others ignores individuality. I gave the example that the archetype “band geek” may represent an affinity to music, but within that affinity, there exists great variance of taste, style, and even level of interest. In fact, being a band geek doesn’t tell you as much about a person as you might think. The human inclination to define people and things in archetypes is a relic from the biological need to quickly determine if the lion staring you down is friend or foe. This way of thinking is essential for human survival, but should remain in the realm of quick decision-making and should not be used for making sweeping generalizations. As much as we have a tendency to say we were the nerds, the in-crowd, the goths, or a member of any other high school group, these descriptions are hardly life-long characterizations. To be truly human, we must belong to more than one box, like the middle of a Venn Diagram, we are made up of an identity based on multiple affinities. More than other MBTI types, INTJs may find that in terms of school archetypes, one size does not fit all. INTJs are curious about the world and strive to improve themselves, so the idea of conforming to one social identity often creates a feeling of isolation as INTJs flit between groups, never feeling strongly drawn to one or the other. INTJs may feel that they are closest to nerds or geeks, or even bookworms, but in truth, an INTJ may also be a jock, an honors student, an artist, or a writer for the school newspaper. INTJs try it all, and through refusing to be defined by one group, INTJs may find themselves on one of three paths: They may become isolationists, taking on the lone wolf mantle and living an alternative lifestyle or even developing neurotic tendencies like anxiety and depression. Two, they may develop a mask to better fit in and pass through undetected in what seems like enemy territory. And three, they may develop a holistic understanding of the system they are operating in, as well as the players in it, becoming the wise yet cynical sage, like Jane Austen’s Emma. Often, when INTJs learn about MBTI and discover the INTJ designation, the sense of relief can be so overwhelming, they may discard other affinities to wholeheartedly embrace the INTJ affinity alone, but to be well-rounded, INTJs should maintain their interest in a holistic approach to life and self-actualization. Regardless of the path taken by the INTJ, it’s important to remember that, just as the pressure to create a social identity can cause feelings of isolation and anxiety, the paths we take on our MBTI journey of self-discovery does not define us. Identity takes a lifetime to develop; it certainly isn’t close to completion during our school years. Identity, both social and private, changes with new experiences and the acquisition of new knowledge and understanding. Affinities, like band, or an interest in technology, are simply one aspect of identity, an aspect that can also change as we grow and learn. I certainly don’t have an affinity for the children’s show Barney, even though I did as a young child. Similar to our discussion of passion and purpose in our music mogul archetype, the pressure to know ourselves and to have a fully developed identity is strong, especially when we are young. Everyone is pushed to be this or that, but as the Gavin DeGraw song, I Don’t Want to Be, so eloquently puts it: I don’t want to be anything other than what I’ve been trying to be lately. . . the INTJ way is about discovering how to be you. Our nerd archetype is just that, comfortable in her skin. Yeah, she’s a nerd, but that doesn’t mean she’s not cool. Her asymmetrical button down says she’s confident. 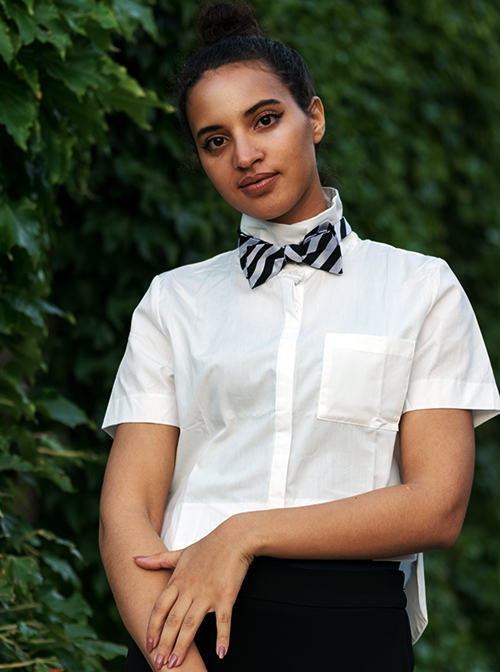 The borrowed-from-the-guys-bowtie says she likes the genderless trend that seems to be getting more popular every year. Oh, and the combat boots, who says a nerd can’t be cool? Besides, nerd she may be, but that doesn’t mean she’s afraid to fight for who she is and her right to compete in the next hacker throw-down.